French bike brand Origine Bicycles looked to make more durable still lightweight frames and to achieve their goals they turned to TeXtreme®. Utilizing their knowledge and novel Spread Tow carbon fiber materials – resulting in an optimized frame lay-up that already have shown a heavy reduction in frame breakages. TeXtreme® represents the next generation in state-of-the-art carbon fiber material and it is now being adopted by the bicycle industry. Based on using Spread Tows instead of yarns, it’s used to create ultra-lightweight, high-performance products. Companies utilizing TeXtreme® Technology achieve significant results in minimizing weight while increasing stiffness and strength, in comparison to other carbon fiber materials. "To get a level with higher performance, the use of TeXtreme® carbon fiber allowed us to develop a radical version of the frame Origin Axxome increasing lateral stiffness through more compact drapes. This results with a steering is sharper and accurate for better control", says Rémi Lefèvre, Communications Manager of Origine Bicycles. The fork built with TeXtreme® materials is almost 19% lighter than the standard one – 320 grams in comparison to 380 grams for previous version. By using TeXtreme® based on thin ply principles with its thin layers’ research studies shows the maximum strength until breakage is more than twice as high when comparing with conventional carbon fiber fabrics. 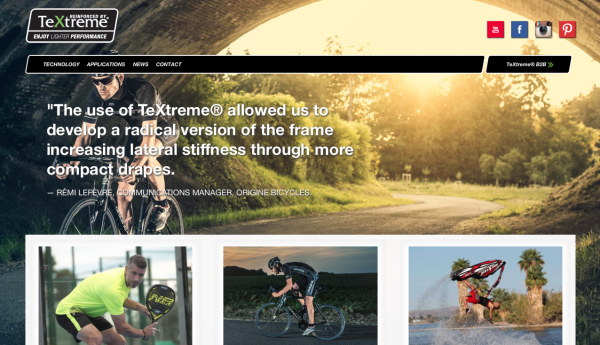 In addition to the bicycle industry, the current use of TeXtreme® is widely used in Formula 1, America’s Cup, NASCAR and Le Mans racing; in the manufacture of golf clubs, surfboards, tennis racquets, table tennis blades, rowing shells, skis, snowboards and ice hockey sticks; and in various industrial and advanced aerospace applications.